PLoS Computational Biology (www.ploscompbiol.org) is an online, peer-reviewed journal publishing works of exceptional significance that further our understanding of living systems through the application of computational methods. It features high-quality Research Articles, invited Reviews and Perspectives, Tutorials, and the popular editorial series of "Ten Simple Rules". As the official journal of the ISCB, it also includes a Message from the Society. All PLoS journals are open access and freely available to read, copy, distribute and use without limits, provided the original authors and source are cited. Cambridge University Press is one of the world's leading publishers of scholarly books and journals in the areas of H&SS. Internationally recognized for the quality and excellence of our products, we publish over 2000 titles and 215 journals every year. 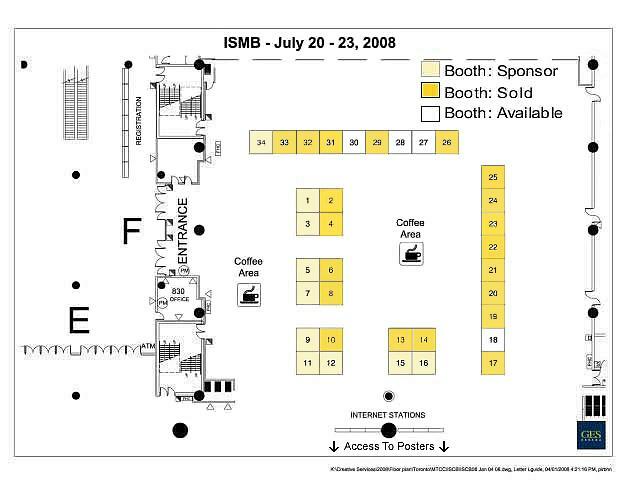 The International Society for Computational Biology (ISCB - www.iscb.org) organizes and hosts the Annual International Conference on Intelligent Systems for Molecular Biology (ISMB), now in its 16th year. The mission of ISCB is to advance the scientific understanding of living systems through computation. On behalf of its global membership, ISCB communicates the significance of our science to the larger scientific community, governments, and the public at large, thus impacting government and scientific policies. Primary activities include providing high quality publications and meetings, and distributing valuable information about training, education, employment and relevant news from related fields. ISCB membership offers many benefits including reduced conference registration fees to several high impact conferences, most prominently ISMB, ECCB, PSB and RECOMB. ISCB proudly offers the open-access PLoS Computational Biology as its official journal, and publishes the ISMB conference proceedings in partnership with Oxford University Press in open-access format as part of a regular issue of Bioinformatics. In addition, ISCB members enjoy exclusive subscription discounts on a selection of journals related to computational biology and bioinformatics. Oxford Journals is a premier publisher whose titles include the fully Open Access Nucleic Acids Research. Oxford also publishes the leading journal in its field, Bioinformatics, as well as Briefings in Bioinformatics and Briefings in Functional Genomics and Proteomics. Visit our booth for a free sample copy of these journals. The IBM High Performance Computing product and solution portfolio provides the high performance infrastructure demanded by life sciences. IBM delivers innovative and powerful breakthrough solutions and technologies that enable organizations to address demands of intense computation, visualization and data manipulation, and the increasingly sophisticated analyses to process the massive amounts of data. The Broad Institute of MIT and Harvard is a unique scientific community of diverse talents but singular purpose: The genomic transformation of medicine. Our organization empowers biology- and technology-focused scientists to collaboratively build, apply and openly share critical tools and data. Visit Booth 12 to explore our career opportunities. BioMed Central is the open access publisher committed to the free widespread dissemination of scientific research. BioMed Central publishes over 180 peer-reviewed open access journals, including BMC Bioinformatics and BMC Systems Biology. Visit the BioMed Central stand to learn more about the journals and the benefits of open access publishing. EMBL-EBI is the hub of bioinformatics in Europe. Our mission is to provide freely available data and bioinformatics services to the whole scientific community in ways that promote scientific progress. Also, to contribute to biological advancement through basic investigator-driven research in bioinformatics, to provide advanced bioinformatics training and to help disseminate cutting-edge technologies to industry. The RCSB PDB provides tools and resources for researchers and students studying the structures of biological macromolecules and their relationships to sequence, function, and disease. The RCSB PDB is a portal to the PDB archive, which includes the three-dimensional coordinates for these biological structures that have been determined experimentally. Bioinformatics activities at The University of Manchester cover a wide range of research, teaching and services. The Manchester Bioinformatics stand will highlight the popular Taverna workflow workbench together with the training courses offered by the Northwest Institute for BioHealth Informatics (NIBHI). Wiley publishes an enormous range of top quality consumer, professional, educational and research material. Wiley-Blackwell, the scientific, technical, medical and scholarly publishing business of John Wiley & Sons, is the leading society publisher and offers libraries peer-reviewed primary research and evidence based medicine across 1250 online journals, books, reference works and databases. NESCent is an NSF-funded collaboration of Duke University, UNC Chapel Hill and NC State University, based in Durham, NC. Our mission is to facilitate broadly synthetic research to address fundamental questions in evolutionary biology by providing an environment for fertile interactions among scientists. BIOBASE Corporation is the leading service and solutions provider for life science discovery. Our BIOBASE Knowledge Library includes TRANSFAC®, TRANSPATH®, and PROTEOME™ databases. Our tools include ExPlain™ and Cell Illustrator. BIOBASE also distributes third party databases BRENDA®, HGMD®. Ocimum Biosolutions is a global life sciences R&D enabling company with three focus areas, BioIT, BioMolecules, and BioResearch. Ocimum delivers end to end genomic products and services out of three strategic locations worldwide, Gaithersburg MD, Indianapolis IN (United States), IJsselstien (The Netherlands), Hyderabad (India). Synamatix is a bioinformatics company focused upon leveraging technology for the acceleration and enhancement of sequence analysis. Software applications built upon the SynaBASETM structured-network database platform are able to process and analyse data from 2nd generation sequencers faster than it is generated. Ariadne creates bioinformatics tools for Biotechnology, Pharmaceutical, and basic biomedical research. Ariadne Pathway Studio provides a biological modeling solution to gene expression studies, analyzing data in reference to protein relationships, pathways and pathway components. BSI develops advanced algorithms based on innovative ideas and research, providing solutions to fundamental bioinformatics problems. Products include: PEAKS, tandem mass spectrometry (MS/MS), RAPTOR, protein structure prediction, PatternHunter, homology searching and ZOOM, next generation sequencing. Our software is globally recognized and used in pharmaceutical, biotechnological, government and academic labs alike. The University of North Carolina at Charlotte Bioinformatics Research Center (BRC) is an interdisciplinary center focused in the Department of Bioinformatics, with widespread interdisciplinary connections in life sciences, physical sciences, and computing and informatics. We offer Ph.D. and Professional Science Masters programs in Bioinformatics. We define Bioinformatics as the discovery, development and application of novel computational technologies to solve important biological problems. BRC is a university partner of the North Carolina Research Campus (NCRC) in Kannapolis, with offices and research facilities at NCRC and at the UNC Charlotte main campus. Our Scientific knowledge and information is essential for drug companies to discover new drugs and get them to market faster, for researchers to find relevant papers and know what's newly published in their subject, and for businesses to optimize their intellectual property and find competitive intelligence.